Century Cycles Blog: Fewer Roads = Less Congestion? Have you heard of Braess's Paradox? It's the principle which states that adding capacity to a network in which all the moving entities rationally seek the most efficient route can sometimes reduce the network’s overall efficiency. It can be applied to many systems, such as computer networks, sewer drainage, and, most apropos to this blog, traffic flows on roads. 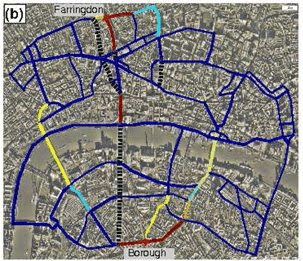 Articles from the Sightline Daily newspaper in the Pacific Northwest and The Christian Science Monitor point to a study titled "The Price of Anarchy in Transportation Networks: Efficiency and Optimality Control," which looked at traffic flows in Boston, New York, and London and found that, when individual drivers seek the quickest route, they sometimes end up slowing things down for everybody. By carefully selecting roads for closure, overall travel times could be reduced. This was actually put into practice and shown to be true in London, as well as Seoul, South Korea. Note that this cannot be generalized to ANY system of roads; it only works in certain special circumstances. But it's a great example of how thoughtful analysis can sometimes yield better, cheaper solutions to common problems. Lately, many pundits have decried the use of federal economic stimulus funds for improvements to biking and pedestrian facilities instead of more enhancements to the motorized vehicle infrastructure. But, if nothing else, this exercise might help debunk the idea that the only good way to make traffic faster is build bigger, wider roads. Fantastic theory. There is no end to the knowledge I can gleam from this blog.